Today was a transfer day between Chicago and Bozeman, staying at the C’mon Inn. The Inn is located some distance from the centre of town, which was not really in walking distance, so we passed a few hours at the hotel before taking a taxi into the town centre for dinner. We had planned to eat at the Copper Whiskey Bar, but did not realise it was in the basement, so instead we ate at Sweet Chili, an asian restaurant located above the whiskey bar. No pictures today! In the morning, we met Martin – another hotel guest who was booked on the Yellowstone tour. He wanted to visit the Museum Of The Rockies, so we decided to share a taxi and visit the museum as well. The museum is the main tourist attraction in Bozeman and hosts an impressive display of dinosaur fossils which have been found in Montana. These include a full scale Tyrannosaurus Rex and several Triceratops skulls (how often do you need the plural of Triceratops?). 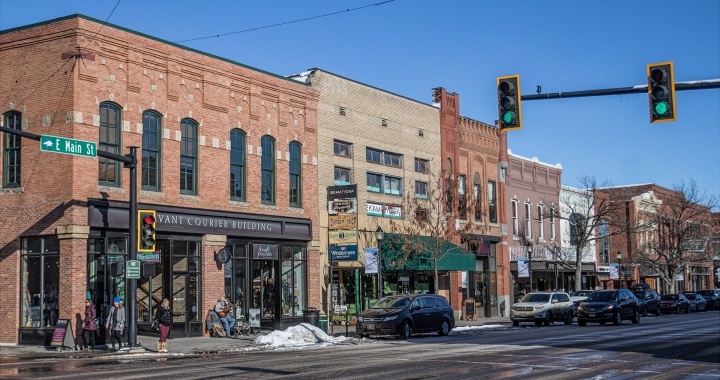 After looking around the museum we walked into the centre of Bozeman through some attractive residential areas, and after lunch took a look around the town centre, photographing a few of the buildings and the local busker. We then returned to the hotel and in the evening met up with the rest of the Yellowstone Tour Group and Ben, our tour guide. In all, there were 8 people booked on the tour from UK, Australia and USA. Whatever Happened to ZZ Top?